The international community needs to pitch in and play a proactive role in promoting peace between India and Pakistan, writes Maria Syed. The world heaved a sigh of relief when the two South Asian nuclear powers eventually de-escalated after a military standoff in 2001-02 that brought them to the brink of war. That crisis was averted only after intensive international mediation. Since then many incidents – most notably the 2008 Mumbai Attack – have ignited hostilities between the two countries, yet a fragile peace has remained intact. As recent events unfold it seems less and less convincing that the South Asian twins will not lock horns once again. Amid celebrations and jubilation in both India and Pakistan to commemorate 50 years of the 1965 War, the beating of war drums is becoming audible. Over the last year peace has become more unstable. A ceasefire that had been successfully been in place since 2004 has seen frequent violations, resulting in loss of civilian lives and severe damage to surrounding properties. From mid-2014, gunfire has been exchanged along the Line of Control (LOC) and the Working Boundary. 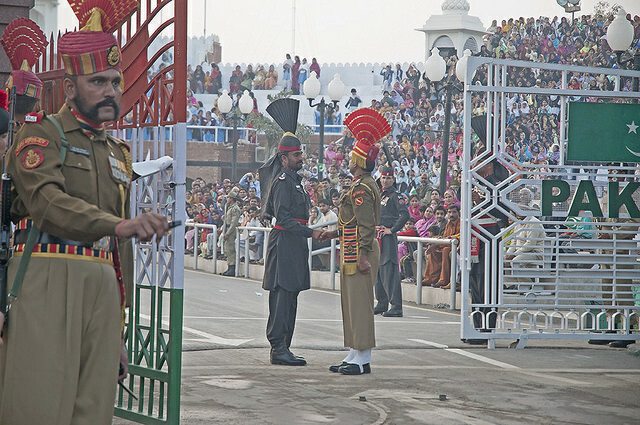 The two countries share three different types of borders with each other: the internationally recognised border, a second border — the LOC — that separates the disputed Kashmir territory, and the third one — the Working Boundary. Exchange of gunfire at the Working Boundary is a worrisome development, due to its potential to escalate to the International Border. It’s one of the reasons the area surrounding the Working Boundary was inspected recently by the United Nations Military Observer Group. Despite frequent interruptions and long suspensions of bilateral dialogue, there remains great merit in its pursuit, and resolving the disputes through dialogue rather on the battle ground. The Composite Dialogue process, though, has not made any headway since its launch in 2003. No dialogue has materialised since the present governments took over in both countries. This has dampened the hopes of peace aspirants on both sides. It is an especially sad state of affairs because the ruling party and almost all political parties in Pakistan spoke of improving relations with India, particularly developing trade relations during the election campaign in 2013. Recent developments have only reinforced the stance of hardliners in both countries. While the difference between hawks and doves gets blurred, the disagreement between the two states becomes even starker. Recently a flurry of events brought the dialogue to a deadlock. Earlier this year, when the heads of the two countries met in Russia, they decided to resume the dialogue process. However differences of opinion over the agenda for discussion, whether terrorism-exclusive or inclusive of other outstanding issues — Kashmir, Siachen and Sir Creek depicting Indian and Pakistan’s positions respectively– could not be bridged. India would not budge on broadening discussions beyond terrorism, while Pakistan would not have it any other way without Kashmir on the table. As a result National Security Advisers (NSA) talks scheduled for August 23 did not eventuate, a repeat of an August 2014 episode when a similar meeting got cancelled. Ominous signs lurk as both sides gradually move up the crisis ladder. Whether this is measured escalation or not is hard to tell, but the situation could rapidly escalate should an event like the Mumbai fiasco occur again. Considering the nuclear dimension of the conflict, the international community cannot afford a ‘so be it’ attitude. It would be better to help the two defuse tensions before thing heat up even further. The United States has expressed its concerns from time to time over the growing tensions between the two nuclear-armed states. Recently, UN Secretary General Ban Ki-moon urged the two countries to resume dialogue. But more needs to be done. The international community needs to pitch in for world peace and should play a proactive role. It must restrain the two sides. Taking sides with either party must be avoided at all costs. Nudging the two towards talks is the only solution to effectively break the impasse. They must be told that talks are inevitable. There is no other way out. Nothing can be settled on the battleground, a lesson the two should have learnt by now, after fighting so many wars with each other. Pakistan is not a normal country which plays by rules. How you conclude that nothing can be achieved by force.You got the part of Kashmir under your jurisdiction by force and not by negotiation.To me it appears that use of force has become more or less the order of the day with one group with a huge might the weaker group has to submit or be ready to see the stronger group’s vision getting implemented with the ordinary people bearing the huge cost even losing their lives and almost all other assets. performance record is much worse they occupied the entire states by force and nobody even talks about that.What is the need of time is to develop the economic and military might that is capable of keeping the opponents and enemies inside and outside the zone in check.At this point I feel that it is an uphill struggle for the PAKISTANI NATION. How you narrate that india occupied kashmir forcibly is completely wrong as it was a princely state run by a Hindu leader and when Pakistan forced it’s military to occupy it the Hindu leader of the princely state hari Singh asked for Indian help with the condition that he would accede the state to India. And thus india threw out the Pakistan aggression yet again and kashmir joined india. World is not blind. Anybody can see the Pakistan’s flag in Indian occupied Kashmir. Indian brutality is going on since 1947 and it is time to END it. Muslim majority Kashmir should have been part of Pakistan at the time of partition but British government gave it to India so that both countries fight with each other and always remain poor for the rest of their existence. For sure their long term planning is working and both countries are investing in ammunition rather than wellbeing of their people. If the Kashmiris want to be part of Pakistan so let them be. India should not make it the matter of their prestige. This should have been done in 1947 instead. Yeah I too accept that.British did the worst politics and that everybody knows. Giving up Kashmir will save lot of money for both countries but it comes to under integrity of country..if we give up this we may have to loose other places like Arunachal pradesh, utharakhand, nagaland. here nobody is noticing that red flag (China) is trying to occupy (economically, geographically) the each adjacent country by using worst thinking nature.After 50 years China treat Pakistan as one of its province and most of the Asian countries will be the expansion of China. Pakistan today is the most dangerous place on earth. If the ISIS succeeds in entering Pakistan the danger is that the military might just work out a deal with them to let them go all the way to the Indian border. Pakistan’s military would calculate that India could then be trapped. Because bombing or battling the ISIS would mean directly bombing or invading Pakistani territory even though Pakistan is not technically attacking India. Another neat proxy war. This is the danger that the future presents. Indian strategists need to be forewarned and prepared to deal with this scenario. The writer of this piece seems to be biased towards Pakistan, treating both countries as equally responsible for the present state of affairs. Certainly anyone who has been following these countries for the past few years can see a clearer picture than what is mentioned here. Pakistan has enough problems with its home-grown terrorists unleashing hell within the country everyday. Bin Laden living in full security right next to the country’s military base; hundreds of innocent school kids slaughtered mercilessly; innocent citizens murdered in broad-daylight because of their religious orientation to name a few. By closing its eyes to the real issues that threaten to destroy it from within, the country finds solace in blaming its neighbor about ‘occupied’ Kashmir. The only way Pakistan can ever move forward to real peace and development is to crush the hard-liners, treat all its citizens as equals and focus solely on economic development. It needs to cooperate with other countries in order to bring the perpetrators of mass-terrorism to justice. Most importantly it needs to stop dreaming about how to win Kashmir from India. I am agreed with you but with slightly different angle.Technically speaking Pakistan is a barrier between india and any kind of terrorism Talibaan ,ISIS or any other.If it fails then delhi will fall once again.Wise india should work for strong Pakistan. Similarly Pakistan need to make good relations with India and as bigger country India has more responsibility. And get another Bombay terrorism incident. Why does no one condemn Pakistan when it has been caught with Kasab first and then Bin Laden on its soil etc?? India has faced much bigger enemy in Pakistan and dealt with it appropriately. All of ISIS and Taliban rouge elements combined cannot fill Karachi. When the day comes and ISIS dares knock on Indian doors, it will be delivered a resounding jhapad that will be difficult to forget for centuries. India is not any invaders cakewalk anymore. Its a united country with each citizen, Muslim or Hindu or Sikh or Christian willing to give away his life for the motherland – not before taking 10 down each. We are beyond any nuclear threats. Have learned to accept the fate when that apocalyptic war happens. Its a price we have to pay for being weak in the past. We will grudgingly but oblige. However in the interest of world peace, responsible people in Pakistan should make sure that their ISI does not play around with their nukes. We take it very seriously. Regardless of the size of the nuclear weapon used by Pakistan, Indian response will be full blown and thermonuclear, obliterating all of Pakistan. We have our sympathy with Baloch and Sindhi people though. Absolutely agree Mr. Kiani.. But Pak policy maker use Terrorists as their tool against India.. how will you infuse positivity in them about India.. how will you make them realize that the path they are treading leads to destruction and misery for the people of the subcontinent..
Kashmir is the child caught up in a bitter divorce between squabbling parents. Do you not consider the child’s, wants, needs or desires in this shambles? An excellent analysis as it sticks to reality. Pakistan is demanding annexation of Kashmir solely on the grounds of religion i e majority in Kashmir follow Islam . At the time of partition , people of Kashmir including majority Muslims did not opt to be part of Pakistan and willingly joined Indian federation. It is for the world to take a call, whether a country can demand annexation of neighboring countries part on the basis of commonality of religion.? Plebiscite is not an option any more, as the first condition of plebiscite was that no country will allow outsiders to migrate in kashmir region, while india had maintained this pakistan have allowed people from other states to migrate there. So we don’t consider this option anymore. And secondly as decided during partition a state can merge itself based on its preference. Raja hari singh opt to be with india, and thats enough to discard pakistan’s claim on the region.it was never about religious belief, since india is secular country, we don’t consider religious beliefs as matter of concern. Only people of Kashmir should be allowed to decide their fate – neither Pak no India. Both are occupying Kashmir and should leave it to the people of the land. Plebiscite should be held in Kashmir under UN and the decision be implemented. Kashmir was Indian territory from time unmemorable and still is. Nothing needs to change or will change this. Invaders and converts should leave. How can someone term bloodshed (Mumbai attack) as a fiasco for the victim?? Please refrain using such languages.Everybody knows who is demanding what and what they deserve..God bless all..Peace. The biggest problem with Pakistan is that it hates its enemy more than it loves its own children. The consequence is that the country’s rapidly growing population is psychologically more prepared to fight against perceived wrongs and misplaced victimization than it is prepared to build a stable and prosperous economy. The second biggest problem is that it thinks it can get away with cultivating vicious snakes (brainwashed Jihadi groups) who will only hiss and strike at Pakistan’s neighbors. The third and final problem is that when the Jihadis turn on the Pakistani state itself, the government and the people of Pakistan see themselves as victims of perceived injustices and which demand additional unconventional responses and even more Jihadi resolve. The whole mass psychosis process simply repeats itself. Pakistan doesn’t like India because of, you guessed it, religion. The sooner the planet ditches religion altogether, the world will be a happier place. Let’s stop believing in fairy tales, it’s the 21st century! I pray both countries will come to a win win settlement.